The first title of the Italian Formula 3 European Series and the title of Italian Champion will be decided this weekend at the speed temple of Monza. The title fight involves Riccardo Agostini, Brandon Maisano and Eddie Cheever. 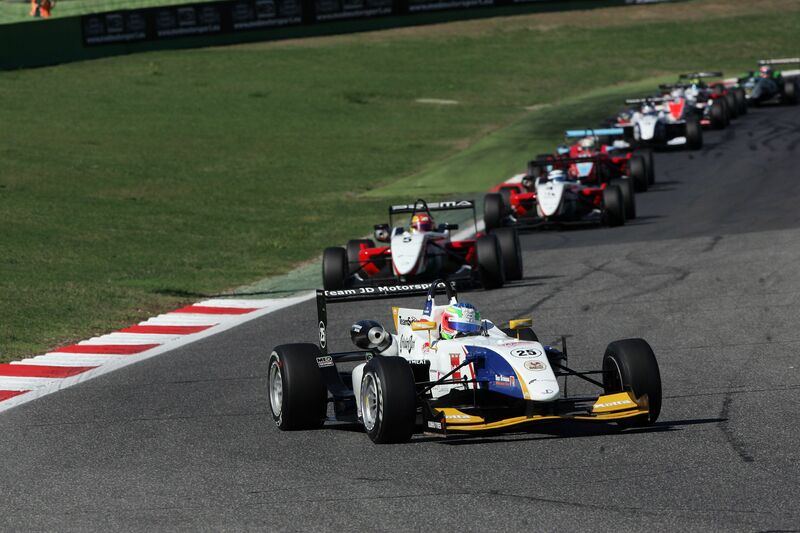 18/10/2012 - All still to be decided for the victory in the Italian Formula 3 European Series and in the Italian Formula 3 Championship. JD Motorsport's Riccardo Agostini leads both classifications after the appeal regarding the second race of Mugello has returned him the 12 points of the third place obtained in the race. The driver from Padova has now 240 points in the European series and leads Brandon Maisano, at 229 points and Eddie Cheever, at 227. In the Italian Series, Agostini has 183 points, that is nine more than the French pupil of Ferrari Driver Academy Maisano, while his team mate at Prema, Eddie Cheever follows at 155 points. All will be decided on the 5793 meters of the very fast circuit of Monza. 58 points are still available to the youngsters of the series, but the fight for the final win will be conditioned by the "outsiders" that do not have title ambitions but that want to shine in the last round of a season that has seen nine drivers exchanging on the top step of the podium. Kevin Giovesi will certainly be among the ones to keep an eye on, at his fifth round with team Ghinzani. The Milanese is in fourth place of the Italian series and, thanks also to his experience, he will certainly be among the protagonists of the weekend, as the team mate Robert Visoiu, the youngest race winner of the series that slowed down a bit in the second half of the season. Henrique Martins will also compete for the victory; the Brazilian in force at Prema Powerteam obtained three wins so far in the season and would certainly like to add some more. Agostini's team mate at JD Motorsport Nicholas Latifi is seeking confirmations, as the Canadian coming from karts in Vallelunga obtained his first win in career and in Monza he will try to repeat himself. The two color bearers of team Euronova, the Moscow driver Sergey Sirotkin and the Japanese Yoshitaka Kuroda will also be ready for Monza. Sirotkin gets to Monza after an amazing season also in Auto GP, while Kuroda struggled a lot in his first season in the Italian Formula 3. After the podium obtained in Vallelunga, Mario Marasca on the Dallara of BVM, will in turn try to end in the best possible way his debut season.